Back in 2005, when he released the excellent Iqbal, I remember writer-director Nagesh Kukunoor saying: a few minutes into the film, you will forget that my hero is deaf-mute. Truth be told, it was a while after watching Iqbal that it struck me the leading man was also Muslim sans all the indulgent clichés and compulsory cultural markers associated with Hindi film Muslims until then. Kukunoor’s conviction and approach to that character come to mind each time I watch a film on a differently abled person or minority community member, and I find myself asking: does it pass the Kukunoor/Iqbal Test? Director Siddharth P. Malhotra’s new Hindi film is about a teacher who is tasked with bringing an unruly, disinterested class of financially backward students in line. Apart from the children’s background, Naina Mathur (Rani Mukerji) faces two additional challenges: their elite Mumbai school, St Notker’s, seems resigned to their fate; and Naina has Tourette Syndrome, a disorder characterised by vocal and motor tics, in her case a tendency to make certain loud involuntary sounds and swing her head to the side while touching her hand to her chin, most especially when she is agitated. Her battle then is not just to help the girls and boys of Class 9F overcome their own pessimism and the prejudice they face from some of the richer students and one particular teacher, but also to guide them past the prejudice they direct at her. 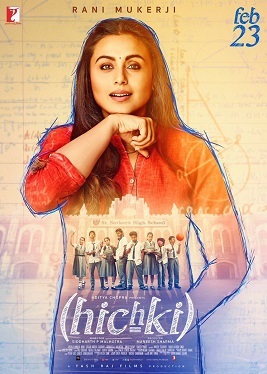 Hichki (Hiccup) is based on the book Front of the Class by Brad Cohen and Lisa Wysocky which was made into the 2008 American film of the same name. Frankly, although it will very likely prompt scores of Google searches in the coming days, Hichki is not about Tourette’s – Malhotra’s film is designed to have us looking past Naina’s condition, seeing her as a woman who happens to have Tourette’s and is determined not to allow her students to succumb to their worst fears or insecurities, to recognise their own failings and biases even as they battle the biases others hold against them. Tourette’s is just one of multiple factors steering this screenplay – written by Anckur Chaudhry, Malhotra himself, Ambar Hadap and Ganesh Pandit – that, interestingly for patriarchal Bollywood, has taken a male-centric literary work and adapted it with a woman as the protagonist. The result is a largely engaging film that, despite the hiccups in its writing journey, manages to hit the mark. It is, in some senses, a predictable path. We know from the moment Naina Mathur enters that classroom, how the story will turn out: that the kids will resist her, they will next be won over by her sincerity, and they will finally become her allies. Occasionally it feels rather thin too as a consequence, sometimes manipulative and often also very simplistic. This is, after all, a formula that has been repeatedly visited in films since E.R. Braithwaite took up a teacher’s job in his book To Sir, With Love and Sidney Poitier followed suit on screen more than half a century back. The addition of classism within the school and Tourette’s to the situation does, however, alter the dynamics. In the end then, Hichki offers enough surprises and enough moments of unmanipulative emotional intensity to be a rewarding experience. One of the film’s biggest strengths is Mukerji, who has been seen in only three features – Aiyyaa, Talaash and Mardaani – since the box-office success of No One Killed Jessica in 2011. She lifts Hichki every time she is on the scene, bringing empathy and charm to Naina’s character without at any moment soliciting the audience’s pity. Even when the screenplay is passing through its most slender passages, Mukerji elevates it with her presence. She is surrounded by a bouquet of charismatic supporting actors, not all of whom get the benefit of in-depth characterisation. Most of the students in Naina’s class, for instance, are painted with broad brush strokes and a single defining attribute that do not do justice to the evidently capable actors playing them. Among the ones getting short shrift is Riya Shukla who delivered an electrifying performance in 2016’s Swara Bhasker-starrer Nil Battey Sannata. The youngster with the benefit of the best-written part is Harsh Mayar playing Aatish, the last rebel standing in 9F. Look closely: that casually good-looking guy is the same fellow who played the little livewire Chhotu in Nila Madhab Panda’s I Am Kalam (2011) for which he won a National Award for Best Child Artist. Age has done nice things to Mayar, looks-wise and acting-wise. There are some rough edges that need smoothening out, such as when he is given a somewhat schmaltzy speech to deliver, but overall he has the ability to hold his own in Mukerji’s company and acting chops worth watching out for. To learn how not to be pulled down by a spot of speechifying in a screenplay, he just needs to take notes from his co-star, theatre veteran Neeraj Kabi, playing the doggedly classist Mr Wadia, Naina’s bete noir in the St Notker’s staffroom. Even when the man sneeringly describes 9F as “municipality garbage”, Kabi ensures that his character comes across as credible rather than hyperbolic. People can be mean. People who face nastiness from others can in turn be nasty to those less fortunate than they are. Hichki may not have the heft of Iqbal but it is a valuable reminder, through the vehicle of the Naina-Aatish equation, that intolerance is not justified simply because the person at the receiving end is flawed. It is also, of course, about not giving up on a human being if you spot redeeming qualities beyond their jagged exterior. The film itself is not without its faults, but its uplifting theme and Mukerji’s understated performance serve as compensation. Besides, it drew tears from me more than once, each time when I was least expecting it. Sweetness and good intentions make for a pleasant combination in Hichki.